Kickstarter Pledges Topped $320 Million In 2012; Site Names Year's Top Projects : The Two-Way Kickstarter, the crowd-funding site that pairs indie-minded entrepreneurs with online investors, funded more than 18,000 projects in 2012, according to its end-of-year analysis. The site says more than 2.2 million people pledged nearly $320 million, with 17 projects raising more than $1 million. Kickstarter, the crowd-funding site that pairs indie-minded inventors and entrepreneurs with online investors, fully funded more than 18,000 projects in 2012, according to its end-of-year analysis. The site says that in total, more than 2.2 million people pledged a total of nearly $320 million. For the year, 17 projects raised more than $1 million. Those numbers come from Kickstarter's look back at 2012 — a year in which the site raised $606.76 every minute. The two most popular categories were music, which had the most projects funded, at 5,067, and games, which attracted the most money, at $83 million. FUBAR — Graphic novel about World War II-era zombies hit best-seller lists. MaKey MaKey — An invention kit that combines low-fi with high-tech. 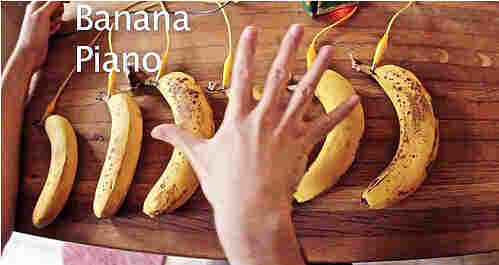 One project: make a piano out of bananas. Chattanooga — The city has its own font, which is used on bike lanes, street signs, etc. PongSat — A plan to send "1000 Student Projects to the Edge of Space" came to fruition and is going strong. The projects fit inside ping-pong balls. Dark Sky — An app that predicts weather "down to the minute," with stylish radar. Amanda Palmer — The Boston musician raised nearly $1.2 million to record an album, promising deluxe extras for those pledging $25 and more. Cards Against Humanity — A party game for adults; think of it as (Bad) Apples to (Rotten) Apples — did well on Amazon. Air Quality Egg — The small device gives local readings for carbon monoxide and nitrous oxide. Baghdad Hackerspaces — The project aims to open collaborative workshops in an area that was once a cradle of scientific and artistic thought, says founder Bilal Ghalib, of Beirut. Squirrel Census — In Atlanta, organizers sought ways of "visualizing squirrel data and stories," using an urban wildlife count. Kickstarter says money was pledged by people in 177 countries. And some investors were return customers, with around 50,000 people investing in 10 or more projects. Some 570,000 people backed two or more projects, according to the site's breakdown of its investors. The funding website also dealt with some growing pains in 2012, when it adjusted its policies on the kinds of disclosures entrepreneurs needed to make when asking for money on the site. It also sought to clarify the question of whether project backers should see themselves as donors or as investors, in a blog post titled "Kickstarter Is Not a Store." That clarification came soon after an NPR story that looked at what happens when a Kickstarter campaign fails.